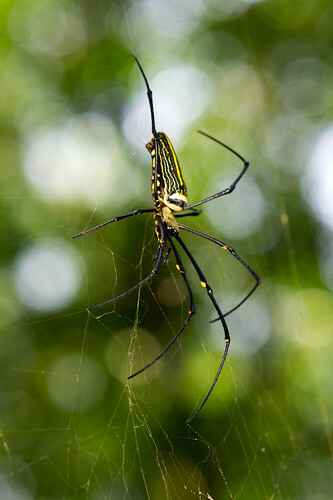 The Giant wood spider (Nephila maculata/nephila pilipes) is also called as the Golden Orb web spider or as the Banana spider. 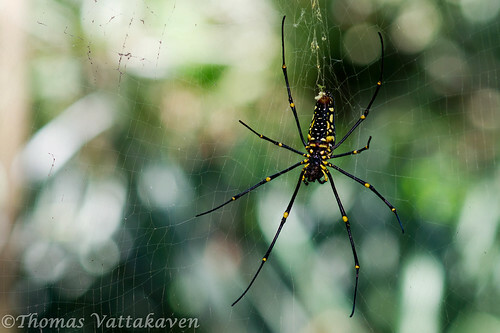 It is one of the largest spiders in the world. 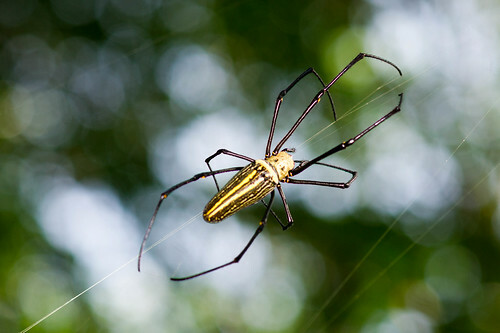 The golden colour of its web is what gives it one of its names. Its silk has a yellow colour due to the presence of xanthurenic acid and quinones. The web itself is the strongest of spider webs. 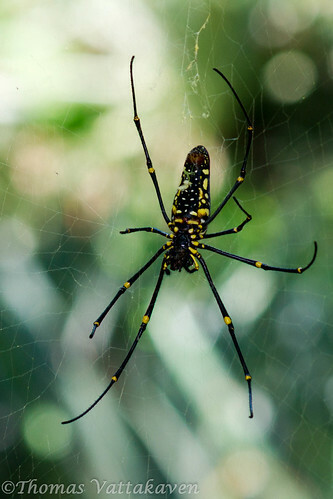 The Orb-weaver’s silk is almost as strong as Kevlar. 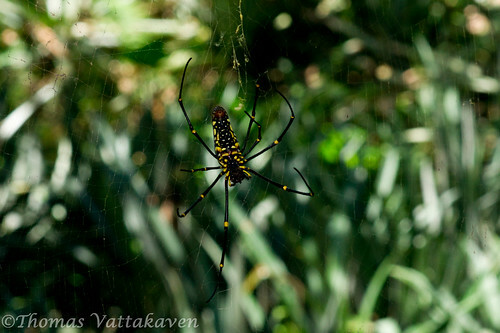 The web itself is known to be several meters in size and is strong enough to trap small birds and large flying insects. However, trapped birds can end up destroying the web in its struggle to get out and are unintentional and unwanted targets. The spider does not feed upon these birds. 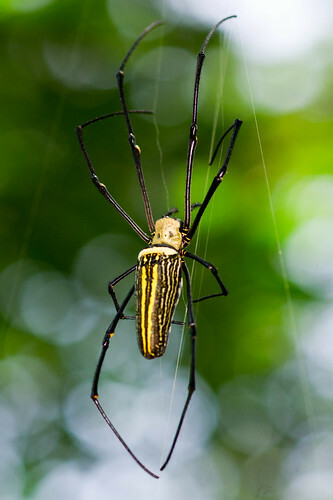 The spider is known to leave insect wings within its large web as a visible warning to warn off birds. Its usual prey is insects such as butterflies, grasshoppers etc. which get stuck in its nest. The spider possesses a neurotoxin with which it immobilizes the prey before feeding upon it. The female, pictured here, is several times larger than the male. While the female has a size of approx 20 cm, the male measures barely 5 cm. If fact, it is comparatively so small that it lives in the web of the female and steals her food without her even noticing him. When it is time to mate, the male usually creeps up to the female and inseminates her while she is feeding! 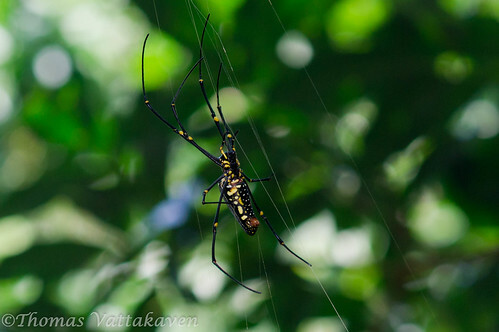 When the eggs are to be laid, the female, unlike most spiders, digs a hole, lines it with silk and lays her egg in it. When the young spiders hatch they have to quickly disperse before they get cannibalised by their siblings. All these facts makes the Giant wood spider one interesting arachnid!